It’s maddening, but true: we know very little about the authors of some of best cookbooks ever written in America. Thanks to today’s 24/7 media cycle, Paula Deen’s foibles and Rachael Ray’s battle with her weight are no mystery. But we know next to zilch about Lettice Bryan, who wrote an amazingly detailed, 1300-recipe cookbook, The Kentucky Housewife (1839). According to genealogical work done by her descendants, Lettice Pierce, born in 1805 in Lincoln County, Kentucky, married Edmond Bryan on July 15, 1823 in Adair County, Kentucky. Many of the recipes in her cookbook date to days before the nineteenth century and were probably handed down from the Pierce and Bryan families. She also, obviously, found Mary Randolph’s 1824 The Virginia House-wife to be quite a resource in piecing together her book fifteen years later. Bryan’s families followed the migration patterns of many early settlers on the frontier, as the area in southwest Virginia and eastern Kentucky and Tennessee was called at the time. Her relatives apparently originated in Virginia and it is not unusual, therefore, for some of the recipes and techniques to be identical. Or at least quite similar. There’s no way to know what type of house Mrs. Bryan lived in, nor the layout of the kitchen where she oversaw the cooking for her family. But let’s make an assumption that she lived, at least later in life, in a dwelling far grander than a log cabin. Her early years as a wife could, easily, have been a log cabin, that emblematic symbol of the American myth, personified by Abraham Lincoln, born in a log cabin in Kentucky. But then a few other presidents were also born in log cabins. 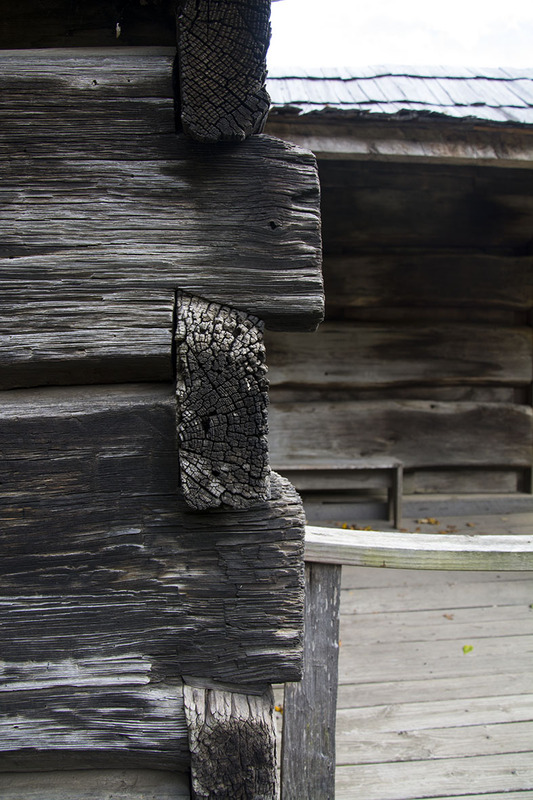 Digressing here, for the history is fascinating, the log cabin of the American frontier came from building traditions found in northern Europe, primarily due to Finns and Swedes who settled in the Delaware Valley around the 1630s. It was natural that they would utilize this style, for the plentiful forests of the New World were ripe for the pickings, so to speak. C. A. Weslager, whose book – The Log Cabin in America: From Pioneer Days to the Present (1969) – is still considered a classic on the subject, wrote that the Finns, as well as the Swedes, had a “close attunement” with the forests. Most cabins measured approximately 12 by 16 feet, and some stood very low, because while it was possible for one man to build a cabin by himself, usually over a two-week period, what was not possible was to stack the logs much higher than 6 feet for the walls, not unless he had family and neighbors pitching in. He couldn’t lift the logs higher than that. 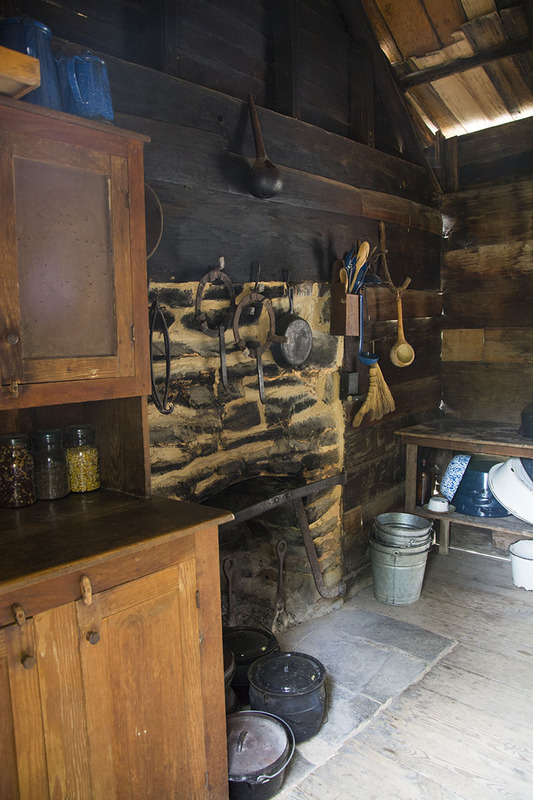 As this blog purports to be about cooking and food and history, what interests us here is the “kitchen,” usually a hearth at one end of the cabin, built of stone or clay. 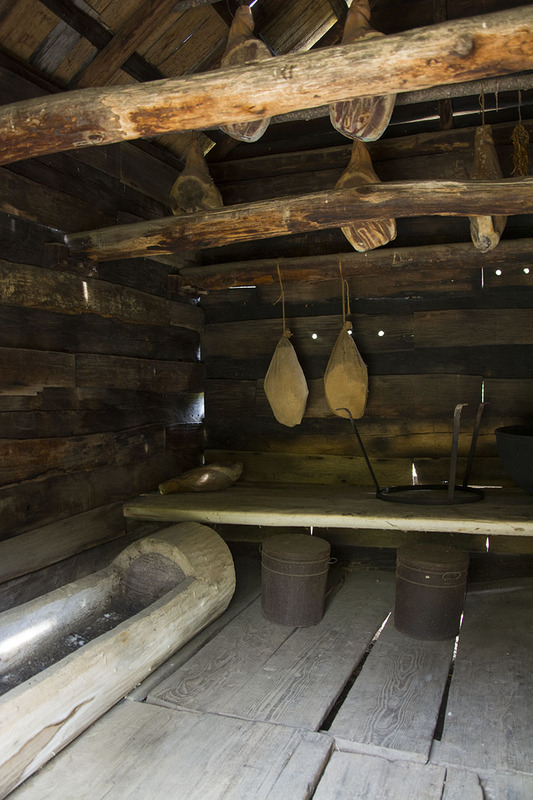 Settlers built the hearth on heavy stone footings, attached to an outer wall or built in the middle of the cabin. 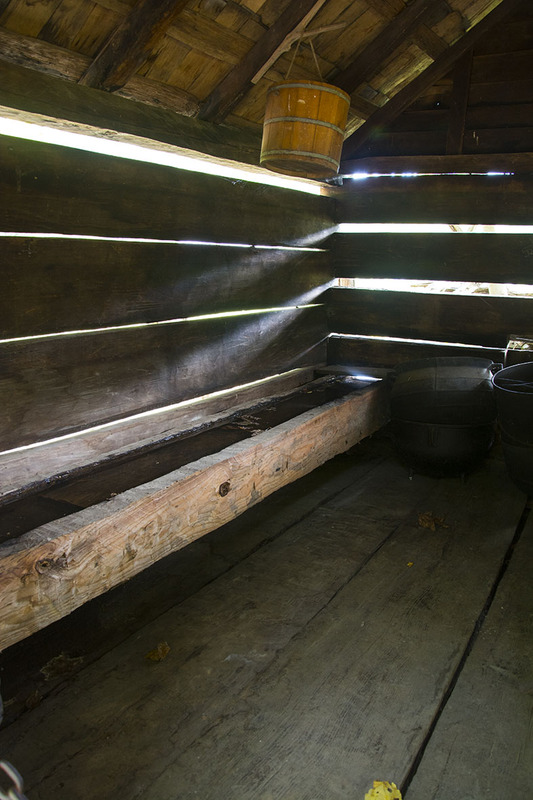 Stones under the floor sometimes helped to radiate heat throughout the cabin. But the truth is that the walls were not insulated and if the chinking cracked, the wind blew in. Cooks used back bars and cranes made of forged iron to hold cooking pots. Specially designed trivets held other cookware and allowed the cook to stagger the heat and cooking times. This, then, could have been the scenario in Mrs. Bryan’s house. It is obvious that Mrs. Bryan knew how to cook and she wrote her book with the plantation mistress in mind. Or at least the woman who managed the servants and slaves doing the actual grunt work of roasting meat in front of a blazing hearth or hand-cranking ice cream. It took two hours of turning for the latter. John Egerton, a prominent commentator on the South, stated in Southern Food: At Home, on the Road, and In History (1987) that between 1750 and 1860, Southern cuisine prospered because wealthy Southerners could afford the best of ingredients from far away and the slave population grew rapidly, making it possible to display the lavish hospitality that circumscribed the Southern household. Mrs. Bryan, among the numerous cookbook authors of the time, was close to being the only one that mentions the slave cooks: “Have established rules for servants and slaves to be governed by, and fail not to give them such advice as is really necessary to promote their own welfare as well as your own.” Most cookbooks of the time, if they mention kitchen help, refer to them as “servants.” Of course, at times Mrs. Bryan does lapse into the usual fatuous language that blurred the exact relationship between the mistress of the household and servants/slaves. The Kentucky Housewife is also unique in the detail that the author provides in the recipes, giving a much more in-depth picture of how a genteel Southern kitchen operated at the time. To be sure, most Southerners did not own slaves and likely subsisted on a much simpler diet of cornbread, beans, salted pork meat, and boiled greens. And besides chicken or rabbit, another meat source – readily available and offering a taste of fresh meat outside of the usual fare of salted meat – was squirrel. Mrs. Bryan offers up a recipe for this small furry creature, as does Mrs. Randolph in The Virginia House-wife. Take two fat young squirrels, skin and clean them nicely, cut them into small pieces, rinse and season them with salt and pepper, and boil them till nearly done. Beat an egg very light, stir into half a pint of sweet milk, add a little slt, and enough flour to make it a stiff batter, and drop by small spoonfuls into the soup, and boil them with the squirrels till all are done. Then stir in a small lump of butter, rolled in flour, a little grated nutmeg, lemon and mace; add a handful of chopped parsley and half a pint of sweet cream; stir it till it comes to a boil, and serve it up with some of the nicest pieces of the squirrels. Soup may be made in this manner of small chickens, pigeons, partridges and pheasants. Cut up two hares, put them in a pot with a piece of bacon, two onions chopped, a bundle of thyme and parsley which must be taken out before the soup is thickened, add pepper, salt, pounded cloves, and mace, put in a sufficient quantity of water, stew it gently three hours, thicken with a large spoonful of butter, and one of brown flour with a glass of red wine; boil it a few minutes longer, and serve it up with the nicest parts of the hares. 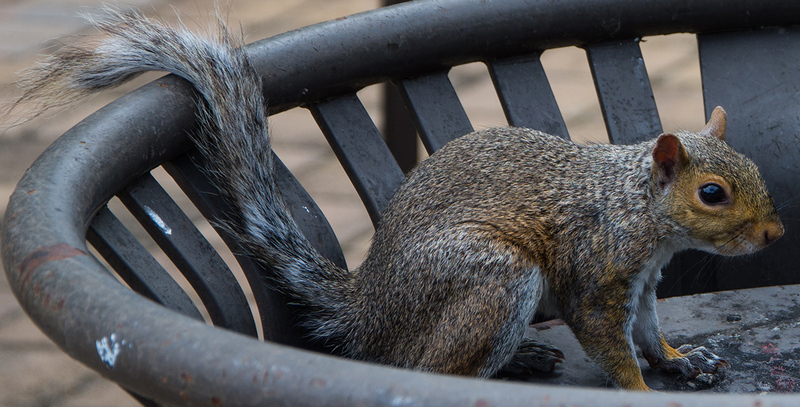 Squirrels make soup equally good, done the same way. What strikes me about these recipes is not the fact that Mrs. Bryan might have borrowed the basic idea from Mrs. Randolph’s book, but that they both incorporate very French techniques: beurre manie in the case of Mrs. Bryan and bouquet garni in the case of Mrs. Randolph. Not unusual in light of the French influence in England in the 18th century. The Kentucky Housewife deserves deeper study and comparison with other Southern cookbooks of the period, The Carolina Housewife (1847) by Sarah Rutledge being another. 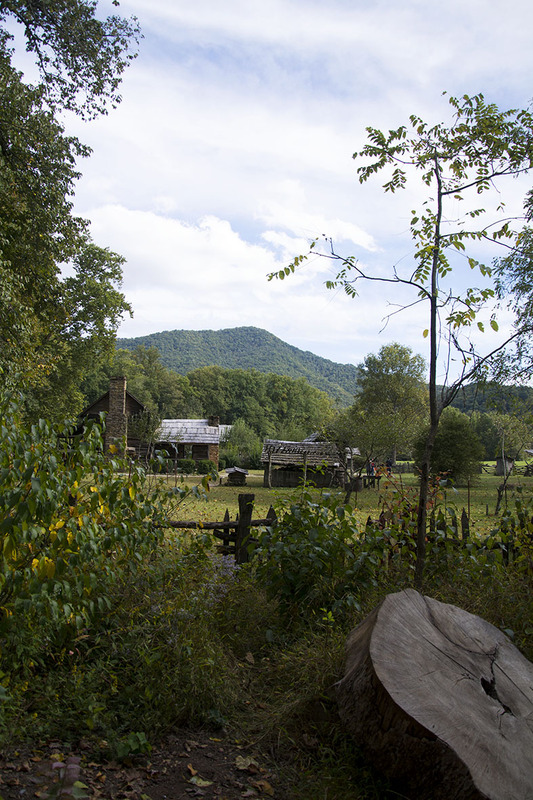 Note that the pictures for this essay come from places in eastern Tennessee, but they well represent similar sites in the rest of the Appalachians. Next Post Real Mayonnaise, Real Food? Or Just Sanctimonious Snobbery? Thailand Everyday, thanks for your comment, it means a lot. 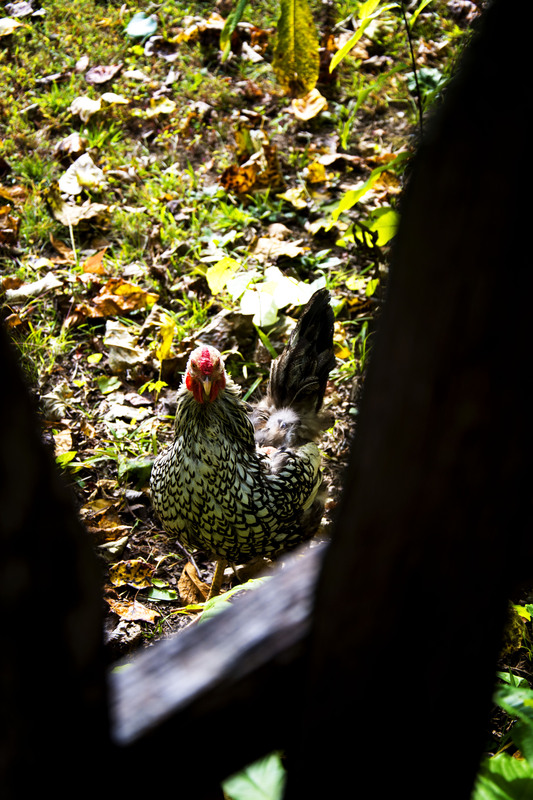 Love the rustic influence in your pictures. Kitty, good to hear from you. Hope all is well. Yes, squirrel takes a bit of an attitude adjustment, I will admit. Thank you, Susan, for stopping by. Hope to “see” more of you! I love this cook book. Thanks for the blog. I can eat rabbit, but I can’t get my head or taste buds around squirrel! Thanks, Nancy. I think you’re thinking of Damon’s work on Mrs. S. R. Dull’s Southern Cooking and Mrs. A. P. Hill’s Southern Practical Cookery and Receipt Book. Bill Neal is the one who worked on Mrs. Bryan’s book and I cannot find a copy for love or money! Great work, Cindy, as always. If I remember correctly, Damon Fowler has done a lot of work on Lettice Bryan and her book. Yikes, so it does. I guess there’s no online version of Mrs. Bryan’s book. Not sure why I didn’t catch that one, but thanks for your eagle eye. But The Virginia Housewife worked fine! Hi Cynthia, fascinating as always, but your link for Lettice Bryan’s 1835 book clicks through to a cookbook with the same title but by Mrs. Peter A. White, published in 1885…?